The Strathbungo Society was founded in 1971 to help conserve the local environment, and it remains a core interest today. Strathbungo was designated a conservation area (as defined by the Town and Country Planning (Scotland) Act) in 1973 in recognition of the architectural and historic importance of the area. This was at a time when much of Glasgow’s traditional inner city housing had been demolished and bulldozers were almost literally massed on our borders. Thus the Council’s decision to list Strathbungo’s Victorian terraces and tenements saved them for a new generation of homeowners who have seen their efforts well rewarded. Read a Strathbungo Society pamphlet (PDF, 6Mb) from around about 1984. It covers some history of the conservation area. See also the Bygone Bungo website. The Strathbungo Conservation Area essentially covers all the Victorian buildings in Strathbungo. Sadly, the 20th Century red sandstone terraces of Vennard, Thorncliffe and Carswell Gardens, Titwood Road and corresponding blocks of Moray Place are not part of the conservation area, but they are very much a part of the overall ethos. Owners are encouraged to uphold the general principles of conservation. Nos. 1-10 Moray Place, the original Greek Thomson terrace, are all A listed. 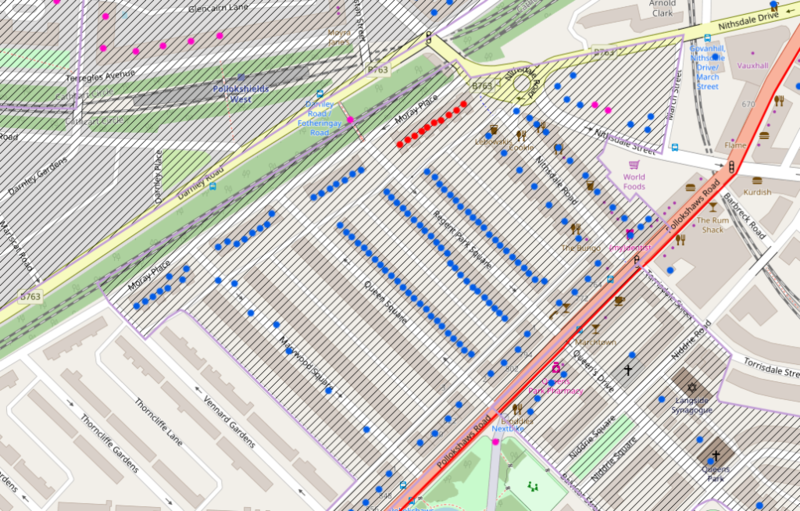 Almost all other Victorian properties, including the Pollokshaws Road tenements, are B listed, except the south side of Queen Square and all of Marywood Square. This Historic Scotland interactive map shows the Conservation Area boundary, and marks every listed structure in the area. That includes lampposts and the railway bridge, not just houses! What’s so clever about a conservation area? You might at first think it’s all a bit negative–Council planners telling you what you can’t do to your own property. But think again. By giving the Council controls over any form of restoration, repair or development, listing can preserve the quality, character and visual integrity of the entire neighbourhood. This protects your investment as there are only a limited number of authentic period properties left and they are much sought after. It also protects you from a neighbour with tunnel vision who might decide, for example, to paint his ‘castle’ bright blue and thereby detract from the whole terrace. If you own a listed property, you must have planning consent for any alteration that affects the character or appearance of the building or its setting — in particular, on the front facade. This covers windows and doors, stonework, steps, roof, chimneys, the lot — even trees — and importantly, there are also restrictions on placing satellite dishes on the front elevation. The commonest error, and potentially expensive, is to remove wooden sash windows and replace them with uPVC. The Council may well force you to put them back, at your own expense. Do not trust the window installer who says it’s all fine – they are not the ones who will pay twice. It applies to all windows in a listed building, and front windows in a conservation area. Seek Council advice. The Council also provides a helpful, friendly and informative service to assist the community in working with this legislation. For more information call 0141 287 8683. Works to the outside of listed buildings almost always require approval from the Council Planning Department. Get free advice from the Planning Department on 287 6060. Internal alterations, in particular sub-division/reorganisation of rooms will require consent – again the Conservation Officer will advise. You may need a Building Warrant if the works involve altering walls, reorganising rooms or making new openings such as doorways. Consult the Duty Officer at Building Control on 287 8555. You don’t need a Building Warrant for repairs or exact replacements such as structural works involved with rot repairs or replacement windows, providing they are timber and an exact replica of the existing ones. PVC windows are never acceptable in a listed building. All trees in a conservation area are protected and any pruning, lopping or felling requires approval. That doesn’t mean you can’t deal with a tree that has become a nuisance, but first contact Planning’s landscape section. Pollarding is never acceptable in a conservation area. Get your paperwork in order. If you are advised that approval is not required, follow this up with a letter and ask for confirmation from the Council. You will avoid problems in the future should you come to sell your house. Make sure that any architect, architectural technologist and/or structural engineer carries professional indemnity insurance. Ask to see their documents if you appoint them. Neighbours can be a valuable source of information. Strathbungo has some houses and flats that have been refurbished to a very good and stylish standard. There is no better recommendation than word of mouth. Ask on the Strathbungo and Shawlands Community Group Facebook page. They also have a list of recommended tradespeople. Here’s advice from Adrian Jamieson, Vice President of the Federation of Plastering and Drywall Contractors Scotland. Select at least three contractors and ask for written quotations. Use your own instinct as to the type of company you are dealing with. Good indicators are how your enquiry is handled, presentation of the representative who visits your house and the way your quotation is presented. Look for companies with trade association membership as they can be used in case of complaint. Always ask for references from recent, similar jobs and never hesitate to contact previous clients. They’re normally happy to tell you about the work that they have had carried out. When you are happy with the price and completely clear on the extent of work that’s needed, make firm arrangements for the work to be undertaken. Prepare a short note stating the price, the date for the work to be carried out and the approximate timeframe. Keep a copy for your records and ask the contractor to acknowledge receipt. Never pay for work upfront unless this is for a specific item that will be in your possession from the time that you pay for it. If you have any concerns about the work while it is being carried out, raise it with the tradesmen. If you are still concerned, contact the manager or director. Upon completion, check the work and make sure you are completely satisfied before paying for it. Address any complaints immediately — don’t wait until you receive a reminder invoice as this is often affects the credibility of a complaint. Pay for the work promptly as this helps with cash flow for contractors who often carry heavy expenses for wages and materials. They’ll remember that, should you ever call on them again. Historic Scotland have a guide to Maintaining your Home, and a wealth of useful INFORM leaflets that deal with specific conservation issues and maintaining historic properties. Glasgow City Heritage Trust are not currently funding grants for private dwellings (March 2018), but they have in the past, and things may change.